Receive up to $6,000 in Closing Assistance from Charles County, MD! Planning a move to Charles County, Maryland? 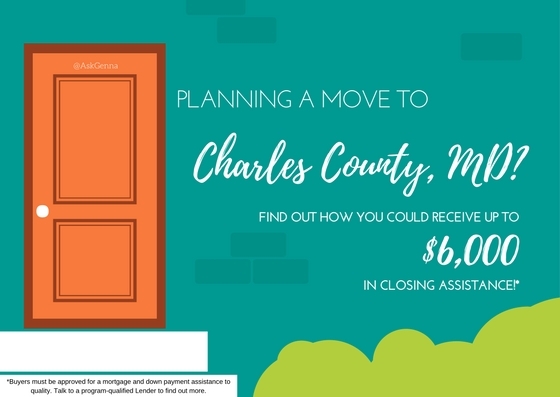 Charles County is offering up to $6,000 in closing assistance to qualified buyers looking to purchase. Funds are limited, so find out if you are qualified by calling a County-Approved Lender today! This is called the Settlement Expense Loan Program (SELP). Approved buyers who qualify for the program are guaranteed at least $1,000 and up to $6,000 depending on how much is needed. This can be used to drastically reduce the amount of cash needed to close on your loan. The best part? This can be used ANYWHERE in the County. New Construction, Resale, Townhomes, Single Family Homes, Fixer Uppers, Estate Sales and Duplex homes qualify. As long as the home qualifies for traditional financing you can add this program. Even better-- you are allowed to use this with a USDA 100% Financing Loan! This could help you to truly purchase a home within Charles County for NO MONEY DOWN. Terms and limits do apply, so please contact a qualified lender today to find out more. We don't expect this program to hang around long (especially with all of the new development within St. Charles) so find out if this will work for you before it's too late. For more background information about the SELP program, check out the Charles County website.